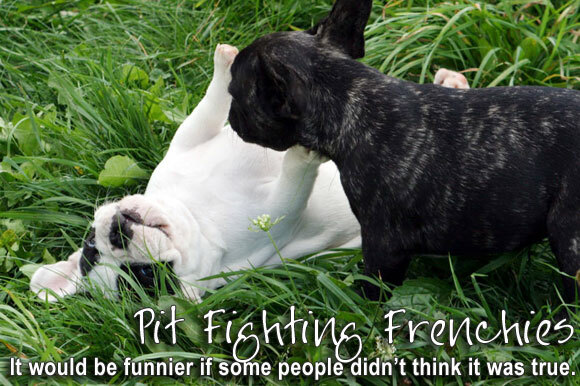 https://i0.wp.com/www.bullmarketfrogs.com/wp-content/uploads/2015/04/Brindle_pied_frenchbulldog.jpg?fit=662%2C662 662 662 Carol http://www.bullmarketfrogs.com/wp-content/uploads/2015/06/bullmarket-logo.png Carol2009-09-10 15:52:532009-09-10 15:52:53When is a Frenchie not a Frenchie? Putting a dog to death for simply looking the ‘wrong way’ is not euthanasia, it’s simply killing. Euthaniasia is putting an animal out of physical or mental misery — BSL killing of innocent, healthy dogs based purely on appearance is not anywhere -near- that. You’re very right, Pai. My mistake for using spin-speak, instead of the more accurate term. It’s insidious how the kill-shelter culture has made it almost automatic for most of us to ‘sanitize’ the concept of pet-killing. I admit that even I have to make the effort to call it what it is sometimes. It helps to think of ‘euthanize’ in it’s literal definition: ‘a good death’. That cuts out most shelter killing and all BSL killing, which is not ‘good’ by any stretch of the imagination. How about voting with our feet and under no circumstances go to any municipality that enforces a stupid piece of c**p legislation in an even stupider way.I have a rescued Boston who is a big boy at 30 pounds, with no paper of course, except for the rescue organisation adoption contract. Sarnia, my dog and I are not contributing one red cent into your local economy. Ever. Oh, and make sure the Mayor’s office and the local chamber of commerce know about it. Let’s keep a log of such places, people, and circulate it a widely as possible. Of course, this is scant comfort for the poor souls who actually have to live there. I’m quite far away — Washington DC — but I also have a big boy rescue Boston. Idiots sometimes ask me whether he’s a pit, and I give them the withering look they deserve. Not that I have anything against Pits, but they’re NOT interchangeable! But I’m staying the HELL away from Sarnia. Oh, as to his parentage, I’ve got nuthin. I guess I would have to carry around a book about Boston Terriers that had lots of pictures, maybe? I try and do good PR every time I take my boy out, repeatedly explaining that, yes, he is a bully breed which doesn’t mean he eats babies from breakfast, in the hope to educate people. And I stay the Hell out of Sarnia! And, Susan, if you happen to have hunting friends in Michigan, pray, tell them where NOT to cross the border. the breed banners/regulators, like terrierman for example, believe that 1) there is no such thing as a pit bull breed and therefore 2) any dog that someone thinks looks like what he imagines a pit bull to be, IS a pit bull. Interestingly enough, in the list of pit bull breeds you quote above, only the Boston terrier has any close relationship to the American Pit Bull Terrier (a relationship many boston people deny which among other things once resulted in an AKC BT club holding a show in a location in which the AmStaff was banned, with no show exemption). The bulldog/mastiff/boxer breeds listed have very little relationship to the bull and terrier breeds. Bans are never about reality. Hm, is that why they bred them from their original ‘pit-bull muzzle’ into the flat-faced bulldog-style that the modern type has?